The Civil Service Live app is back, by popular demand. If you’re going to Civil Service Live 2016 in the coming weeks, this will be welcome news. This year, the app does even more, so you can get more out of the event and give us your views. As well as helping you plan your day and find the exhibits you want to see, the app will allow you to interact with speakers and provide feedback on individual sessions. 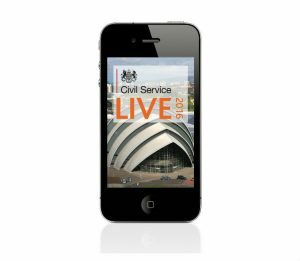 To get the app, search for ‘Civil Service Live’ on the App Store or Google App Store and download – it's completely free. You can then login to the app using the email address you registered for Civil Service Live with and the password CIVIL123. business-card swapping – you can swap your details with colleagues instantly, and forget about worrying what to do with all those fiddly business cards! So, be prepared, and download the app before you arrive. It's available now. And, a last thought – if you have registered for Civil Service Live but, for whatever reason, you are now unable to attend, please ensure you log in on the registration site, cancel the sessions you have booked, and then cancel your booking as a whole. We will then be able to reallocate those places to other civil servants.